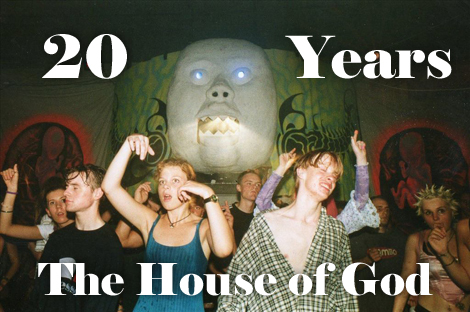 A ramshackle and joyous celebration of DIY spirit, raw techno and uninhibited abandon, Birmingham’s legendary hive of sin and damnation, the House of God, celebrates its 20th anniversary this year. 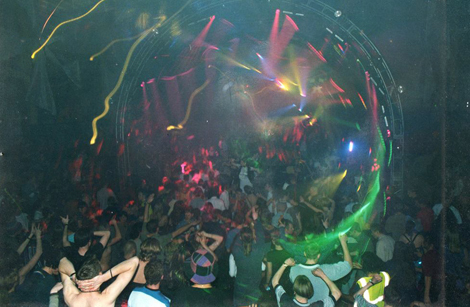 Founded by high priest Chris Wishart alongside residents Sir Real, Surgeon, and Paul Damage, over the past two decades House of God has gained a legendary reputation for eccentric and gloriously odd festivities soundtracked by the grittiest and most incendiary house and techno (and jungle/acid/Sabbath) around. 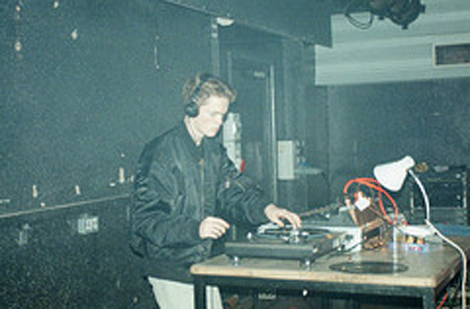 Born of a passionate desire to provide a raucous and free spirited party where musical quality and storming atmosphere were placed well above big name lineups and slick production, HoG quickly became a safe haven for all manner of party freaks — flying in the face of both the flashy elitism of commercial house and po faced underground techno aesthetic that predominated in early 90’s Britain. 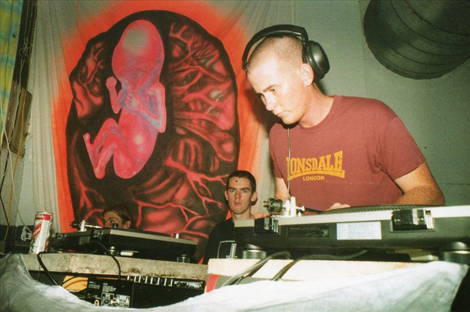 Little White Earbuds caught up with promoter Chris Wishart, resident Tony Child (Surgeon) and long time guest Karl O’Conner (Regis) to discuss the genesis of one of the world’s most seminal — and idiosyncratic — techno events. “Looking back today, it’s with a very different perspective from 20 years ago. House of God started because there was nowhere to hear the kind of music we wanted to listen to. In Birmingham at the time, there was a lot of house of the dress code/handbag variety. Clubs like Miss Moneypennys — it was rather a restricted and showy kind of scene. 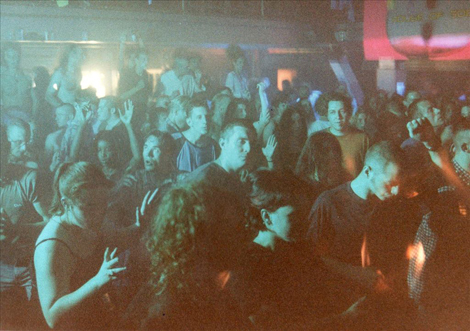 There were a lot of people in Birmingham who had never really had the chance to actually hear the kind of techno that we loved in the club setting,” explains Tony. The initial seeds were sewn by a meeting of Chris, Tony and Neil Spragg [Sir Real] via mutual musical endeavors at Birmingham University. Wishart ran the punk and new wave society, and was also beginning to experiment with techno promotions, while Tony and Neil played at seminal alternative electronic night, Third Eye. Wishart, meanwhile, was adamant that House of God would be a markedly different proposition to many of the other techno nights around the country at the time. Alongside a no-holds-barred musical policy, HoG evolved a completely unique visual aesthetic, based on an especially twisted sense of humor, and nightmarishly acidic visuals. 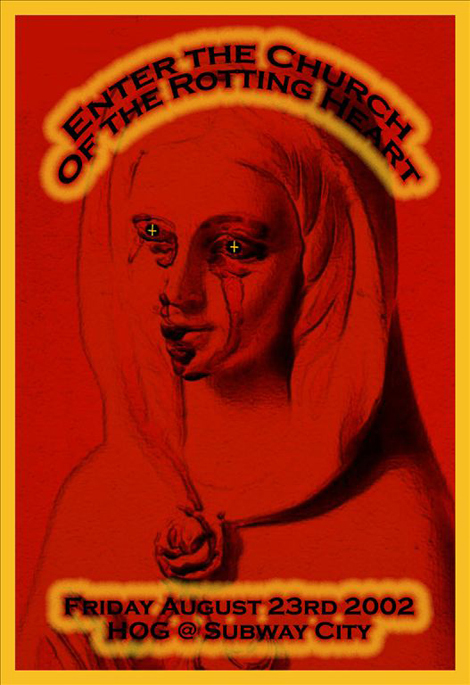 “House of God was named after the DHS track, which was my favorite record. 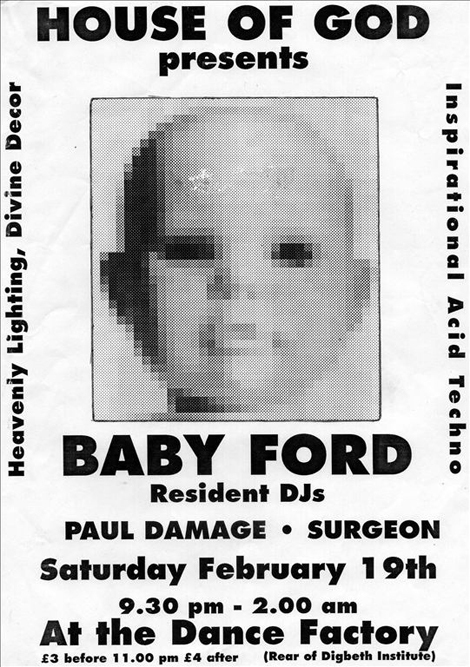 In essence, the fliers and visuals were a reaction against the pervading techno culture of that time. To be perfectly honest, the artwork was usually an exercise in sitting around getting twisted and seeing what came out. [laughs] We were determined not to go down the road of what I considered clichéd techno imagery. You know how it is, you get handed a black and white flyer with a picture of a bit of skirting board or aluminum sheeting on it. It’s a rave — that is the absolute bottom line. It’s a rave — it isn’t some purist chin-stroker thing. If it isn’t mayhem — if people aren’t physically screaming and covered in sweat at the end of the night — then I’m not happy,” Chris explains. 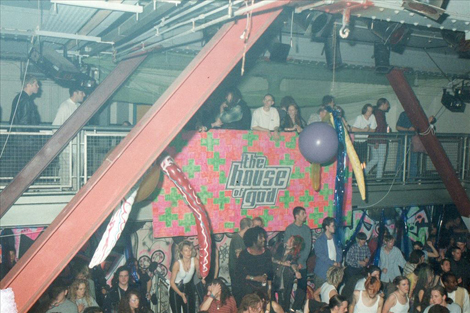 Aside from the fliers, the look inside the club was also at odds with the spartan techno bunker cliché; put bluntly it’s always been a kaleidoscopic riot, replete with homemade banners (“HOGSAT”), colored drapes and lasers, alongside a crowd that makes serious noise — whistles, horns, the lot. 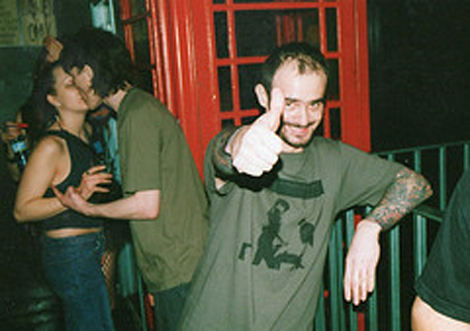 While HoG quickly gained a reputation for enthusiastically pushing the emergent UK techno axis — with DJs like Dave Clarke, James Ruskin and Neil Landstrumm all playing their first Birmingham shows at the club — it would be wrong to suggest HoG is purely about techno. The club’s residents, rather than guests, set the overall tone for the night, and they’re all but impossible to pin down stylistically. However broadly speaking, Sir Real will often dig out a great obscure selection of cranky acid, older cuts and his own exclusives; Paul Damage can go very hard indeed while Surgeon does, well, what Surgeon does best. Harvey Lane and Nicky B handle house, while DJ X runs the DnB room. Curveballs are numerous (indeed, check the “residents’ Youtube selection at the bottom of this article) — let’s just say that nowhere else on gods earth are you likely to hear Luke Slater, Black Sabbath, early gabba and 80s light entertainment “legend” Russ Abbot played on the same evening. “Birmingham techno” this is not. 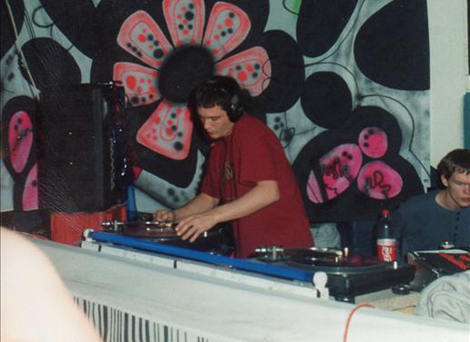 “The whole ‘Birmingham techno’ thing — the mystique and what have you — is a bit of a self-generating myth, to be honest. It’s certainly not something that’s been put out there by Tony and Karl! We’ve had a really wide variety of people play, but I’m never thinking, ‘We must have the newest producers playing the newest tunes.’ In fact, very often we’ve done the whole thing with residents alone. To be honest, when you have Tony as a resident, I never saw much point in booking people who imitate that. [laughs] We’ve got very, very strong residents and although Tony was the one who went on to become really well known elsewhere, the others are just as integral a part of how it all works. Guests tend to fit round what the residents are doing, rather than the other way around. We never went for the minimal thing, for example. That would have been heresy!” continues Chris. Indeed, selling out venues on residents alone is no easy feat; the fact that HoG have continued to do so on a regular basis is testament to both the skill of their DJs and the regard in which the party is held. HoG is still a place where people are dancing in all directions and properly interacting with each other — the DJ is not the focal point. Surgeon was also keen to emphasize the importance of the residents in the flow of the night; and woe betide anyone play too hard, too early. Chris also stressed the influence that underground house, rather than techno, events had on the philosophy toward programming House of God. 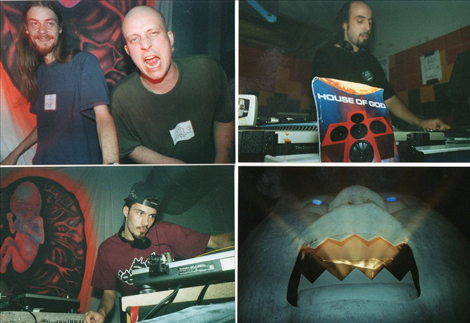 February 2013 saw the 20th birthday party at Subway City — a suitably incendiary affair with Ancient Methods guesting and, after two decades, the passion for music and commitment to the party shows no sign of abating. “The 20th anniversary party was great,” Tony enthuses. “We had people who’d come from Greece, from Spain, all over the place. There were a lot of people in fancy dress, not that we’d billed it as that — it all happened spontaneously. There’s no other club that really has the same feeling as HoG, it’s a unique place. We’re doing another 20 year party in Tokyo in April which should be a good one. 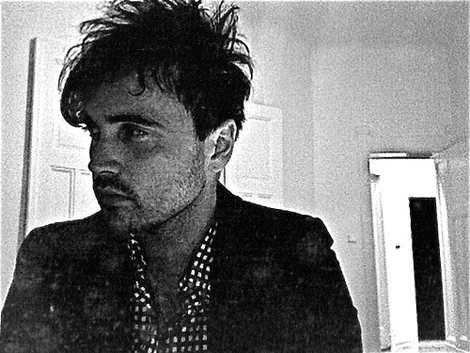 Come with an open mind and you’ll have a better experience — the idea that you’re going to get an entire night of Downwards couldn’t be further from the truth. “In essence, we found the DIY approach to putting raves together natural because of our backgrounds. I had a background in punk, and that was always a case of doing your own flyers, your own gigs, and the whole thing. At the time, there was little blueprint to work from. The fact that we were doing things in the cultural desert of the midlands was a spur, really, and the association with other people around the country, who were experiencing the same things at the same time cemented our philosophy. But the main reason for our longevity is that we kept a down-to-earth approach to what is — after all, just putting on a party. The 20th anniversary was the best we’ve had for years, so we’re going to be carrying it on,’ concludes Chris. “Chris is a brilliant dictator; HoG is by no means a democracy. [laughs] There were no egos involved, he just wouldn’t stand for it. Tony might have just come back from headlining some huge festival gig in Europe and Chris would have him on first playing next to the toilet. Every time I’ve played at the club I’ve queued up at the front with everyone else, it just feels the right thing to do. The next HoG takes place at Subway City, Birmingham, June 7. Follow the House of God Twitter account for regular updates. absolutely brilliant. what a great read. HoG was my home from home from 1995 – 2006? … To this day I’ve never been to a better night, everyone so friendly, Brum has the best attitude when it comes to being in a dark room full of sweaty strangers, where no one knows each other but you feel like your all part of something great, done together. I’m gonna hunt out all my old tickets, I have them in an old shoe box somewhere. Traveling up from Worcester and getting to now Surreal, Regis, Surgeon et al, best times of my life. I have never had this feeling of togetherness at any other club since (well except Atomic jam) another Brum institute. 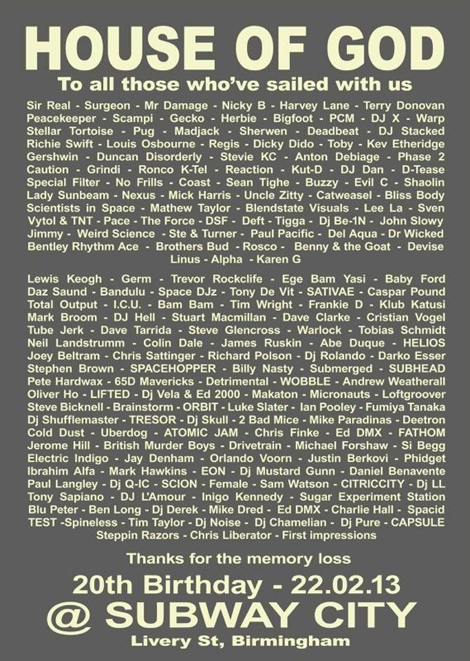 Que Club is still to this day the most amazing place to lose yourself too, subway city was pretty special too. coming down the stairs of atomic jam at the q at 6am sunday with the hog-flyer guy shouting HOUSSSE…OF GOD at the top of his voice. been going for 20 years. still as good. highly entertaining read. educational as well for someone like me who’d never heard of these parties before. wish I was in the UK/not broke to attend one because they sound like a shitload of fun. btw, you’ll are doing some good work with these longform pieces lately LWE. Keep it up. Defo the best night out, great people, brilliant atmosphere. Been going since the start. great read. Slater’s Class Action, classic! great nights, used to do stuff there with a group called blissbody. and see that massive demonic babies head with strobes in the eyes and lazers in its mouth, well i made that.